One of my secret passions is historical literature. While I absolutely love a good story, I also love learning about the past; combining the two can bliss me out. 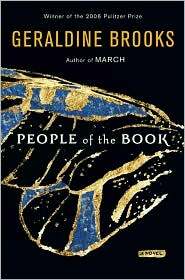 People of the Book is the second Geraldine Brooks novel I've read, and, since she's a Pulitzer winner, my expectations were pretty high. The novel is based on the Sarajevo Haggadah, a Hebrew codex. Hanna Heath is an Australian rare book restorer and is asked to restore the recently rediscovered Haggadah as well as analyze any materials found for possible clues to its origins. Of particular interest is the unknown artist responsible for the still-brilliant illustrations. Hanna travels to Sarajevo, to Vienna, and back to Sarajevo throughout the course of the novel. Also interspliced between Hanna's story are the stories of several people who came in contact with the book-including a Jewish girl named Lola, living in Sarajevo during the German invasion; a Syphilis-infected book restorer named Mittl living in Vienna in 1894; a rabbi, Aryeh, alive in Venice in 1609; and Zahra, a young girl captured and enslaved in 1480 Seville. All of these characters had a hand in either creating or protecting the codex over the span of history. Indeed, the title People of the Book is apt: the novel is not about the Haggadah; rather it is about the people who interacted with it. While the stories themselves were tied together seamlessly and each character was fascinating in his or her own right, the novel's story fell a little flat for me. An impossible-to-avoid echo of The DiVinci Code required Brooks to include a number of different storylines-including a romance, a lifelong question of the identity of her father, and intense conflict with her mother-for Hanna that ultimately detracted from the potential beauty of the novel. There were times, however, when Hanna jumped off the page for me; so, my complaint is more one of a lack of consistency than a lack of good writing or good story. The structure of the novel kept me reading, with Hanna being the backbone of the story and the other characters coming in every-other chapter. The novel is stronger for Brooks tempering herself and not falling in love with these characters-she allowed them to do their part and then did not return to them. Beyond the story itself, historical fiction must teach readers something, and Brooks did a remarkable job with educating readers not only on the mysteries surrounding the Haggadah but also on geography, religion, art, and significant historical world events. I definitely felt as though I came away from this novel having learned something. And though Brooks emphasizes that the majority of the book is fiction, she blended the real with the fantasy flawlessly. Is this the type of novel I'd expect from a Pulitzer Prize winning author? Probably not. Do I regret reading it? Absolutely not. It was not only worth my time but was an enjoyable read with characters that I will remember for some time. I thought one of the most interesting relationships in this book was the one Hanna had with her mother. Say more about that? It was, to me, really hackneyed…the whole “You didn’t become a doctor so your job has no meaning” combined with Hanna’s “You wrecked my growing up with your lack of parenting”. I found them both exceptionally interesting characters as individuals, but I’ve seen their relationship a billion times before.